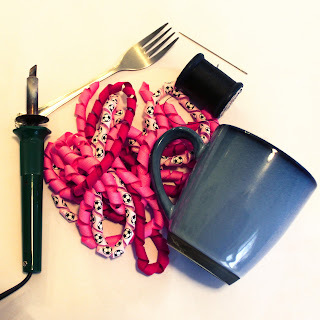 We conquered the challenge of how to make curly ribbon last time on the blog Korkers and Power Tools Part 1 so now we are gonna wrap it up and show how to make 'em! 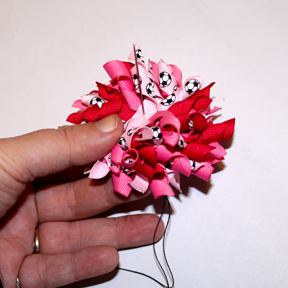 There are a variety of ways that crafters put korkers together from tying to gluing, or even using zip ties. I have tried all these methods and I hate to say I prefer sewing. I hate saying that because it’s not super easy, or fast. 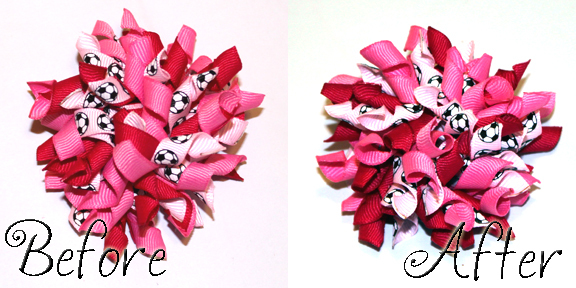 The results I got from the other methods just were not as good as the look I got sewing these bows. However, we do have some fantastic tricks to help out even though it’s not going to be as quick as our normal projects. 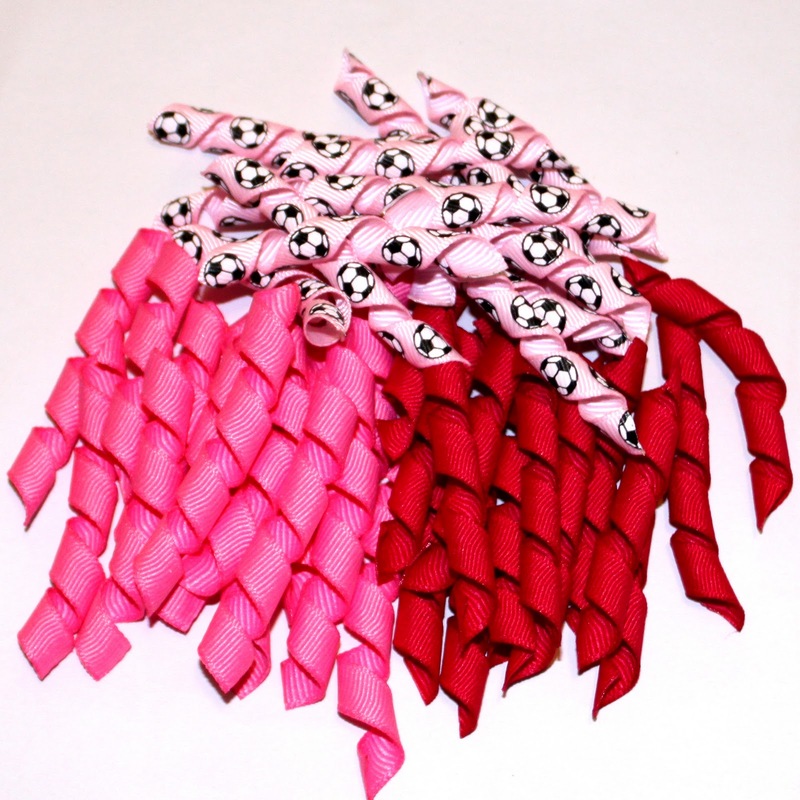 The first step is going to be for you to decide how you want to cut and seal your ribbon bits. You can use the old fashioned way, cutting with scissors and sealing the ends with the lighter. You can also use a wood burner to both cut and seal at the same time. We prefer using the wood burner method for this project. You can buy a wood burner at any hobby and craft store and they typically come with an assortment of tips. We only use the wedge tip most of the time. Set out your glass cutting board (available any Wal-Mart etc), wet your wash cloth generously, place your wood burner in your coffee cup and turn on to warm up. Please exercise extreme caution while working with a wood burner and never leave unattended! I have burnt myself more than once and it’s an instant 3rd degree burn. I might know someone (*cough cough* me *cough cough*) who melted their drapes when the wood burner rolled to the edge of the table before that coffee cup trick went into practice. I also only use the woodburner when children are sleeping so there are no accidents. You need to decide on your preferred "style" and size before cutting. I cut my strands with the grain of the ribbon which is straight across. This gives each strand a point on the finished bow, some people prefer their ends cut blunted. The easiest way to cut your strands is to hold the ribbon down flat then cut. You can space your fingers on either side of where you want to cut and carefully use your wood burner to cut it. Place your wood burner firmly on the glass and at a medium speed across the ribbon. If you use your fingers the biggest problem I have is I am clumsy so I occasionally burn myself and the hot cut ribbon then springs back up and hits my finger tips causing unladylike words to leave my lips. 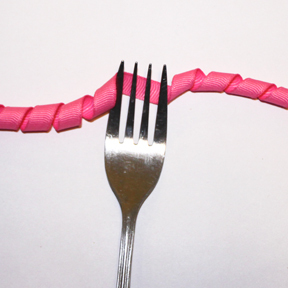 If you hold your ribbon flat with a fork you can cut in between the tines, and eliminate some cussing. Wipe your wood burner on your washcloth from time to time to maintain nice clean edges. For this bow we used cut lengths that were 2 inches long. Keep in mind when determining your size that the finished bow will "grow" a little bit so my 2 inch strips makes a bow that looks about 3-4 inches big when finished. Also, the longer your cut ribbon is the more pieces you will need to make a full looking bow. This is purely a decision on what you like. We used about 35 pieces in our finished bow. Now that you have cut all your pieces, thread your needle and pick up your first strand. Find the center of the piece and place on the needle with the curl of the ribbon facing up. If you are using more than one color alternate the colors and positions as you add the rest of your strands on. 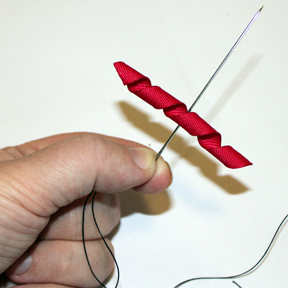 Once you are satisfied with the number of strands push the needle through all the way, and then sew back the other way. Working the needle back through all the strands is sometimes difficult. It is best to use a sharp needle. I turn mine over and use the table to rest the eye of the needle on it and slowly apply pressure to help push the needle through. If you use this method be careful to not flex the needle because it can bend or break. Also, make sure your fingers are spaced appropriately so that you don't stab your finger or end up the in the ER room. 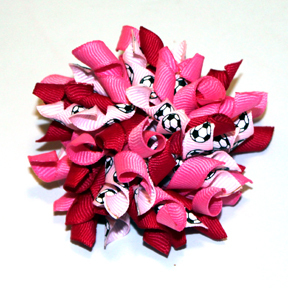 Once your bow is sewn, tie the ends off by knotting. My final step is to fluff and separate. The curls have a mind of their own and like to curl up into each other. Gently separate the curls then you can also spray lightly with a stiffener like starch or fabric stiffener to help keep them in shape during wear. All you have to do now is hot glue to your clip or hair accessory of your choice and you're done! So, who's spending the weekend making pretty curly korkers? Thanks Wendy for this helpful tip. I have burned my fingers way too many times sealing korker ends. Radio Shack makes this thingie that's made to hold a soldering iron. It has a thing that looks like a huge spring that I put the woodburner in. It also has a little sponge that comes out. I wet it and use it to keep the tip clean. It was about $8 and won't tip over! I have some korkers on my desk waiting to be cut with my brand new wood burner! My question now is, what do you put under the wood burner so that you dont burn your table/desk? Thats what I use the glass cutting board for. SO easy! and I use a piece of masking tape on it for my measurements to cut ribbon so its easy to get the right size each time. Hope that helps! Wish I had seen this when I first started making korkers! A couple of tips I've picked up... tape the base/holder for your woodburner to your surface and it won't slide off the edge. I've shifted in my seat too many times and sent the woodburner flying to the floor. The other tip is if you don't want to buy a glass cutting mat, buy an 8X10 picture frame at the dollar store and use the glass from that as a cutting board. Oh, one more tip... if your cutting board gets ribbon residue on it, use some nail polish remover (with acetone) to clean it off. Great idea for a tut, Wendy! What a neat tutorial...along with all the great tips from your followers! Such an inspiration to make some korkers! Thanks for sharing! THank for sharing the source, it is useful informative for me making it!